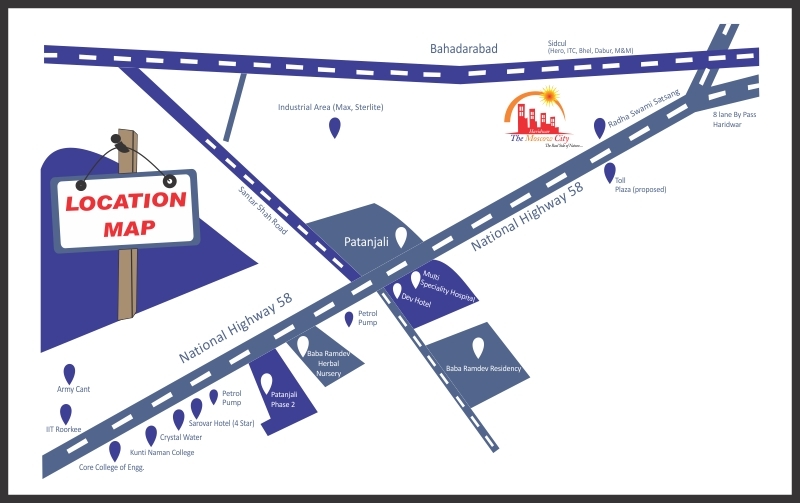 Well connected to N.H. 58 Close to the residential, retail and commercial development in haridwar- Roorkee road World class schools colleges – IIt Roorkee, College of engineering, Roorkee, Gurukul Kangiri University, Chinmaya Degree College with in the radius of 10 KM. By Air : Nearest airport is jolly grant airport in Dehradun, which is a domestic airport located about just 30 km away from city center. Taxi cabs are available from airport to Haridwar city. The airport departs daily flights to Delhi. By Train :A number of express and most train connect the town. Haridwar railway station is a major station well connected to all major cities in India and located just 8 K.M from Marvella City. By Bus : Haridwar is well connected by tourist bus services and state owned by services. All cities in and around Haridwar are connected by state buses. Many deluxe buses are available at a regular interval from all the major cities. Its located just 8 K.M form Marvella City.